The School for Public Health Research is committed to building research capacity in public health. In addition to development activities and training opportunities within NIHR SPHR and the member host institutions, students and trainees also have access to development and support opportunities provided by the NIHR Academy. The SPHR Researchers’ Network (ResNet) links researchers working on SPHR projects across the eight members of the School. It is a forum for communication, peer support and networking to aid the professional development of researchers of any level, through virtual meetings and bulletins, researcher events and networking at the School’s Annual Scientific Meeting. ResNet has an online presence in the NIHR Hub, and is open for any SPHR researchers to access. The Committee for the SPHR Researchers’ Network was founded in 2014, and comprises representatives nominated from each academic centre of SPHR. The position of Chair rotates round the School members. Currently, the position is held by Fuse. The committee meets at least once every two months to review network activity. The NIHR Infrastructure Short Placement Award for Research Collaboration (SPARC) allows early stage researchers supported by an NIHR Infrastructure Award (see eligibility via link) to spend time in other parts of the NIHR. The scheme is specifically designed to foster collaboration and enhance the researcher’s early career, as well as their CV. This award is open for trainees in the NIHR Infrastructure who are fully or partly funded by a BRC, CLAHRC, PSTRC or an NIHR School to apply for up to £500 to support the costs of going to present their work in another part of the NIHR Infrastructure. The award is specifically designed to encourage networking and to enhance the trainees’ experience through presenting their research. 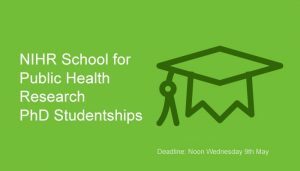 The NIHR School for Public Health Research (NIHR SPHR) is funding up to 25 PhD Studentships as part of an initiative to build capacity in public health research. The studentships will begin in October 2018 and will be distributed across the School’s eight academic centres. Studentships will be aligned to the School’s research programmes and themes. Applications are welcome from individuals with a strong academic record who wish to wish to develop a career in public health research. Successful applicants will be expected to complete a PhD during the award period. Studentship awards include tuition fees, an annual tax-free stipend of £14,777 and a contribution towards research and training costs. The NIHR Infrastructure Training Camp is a three-day intense annual training event for NIHR Trainees from the Biomedical Research Centres (BRCs), Collaborations for Leadership in Applied Health Research and Care (CLAHRCs), Patient Safety Translational Research Centres (PSTRCs) and the NIHR Schools. It is a unique opportunity for trainees from across the Infrastructure to come together and exchange ideas and experiences. It takes the form of a three day residential training camp with a focus on networking, mentoring and interdisciplinary working.